I feel like Yoda evaluating Obi Wan. I hope it turns out better for him than the whole Anakin thing. First a quick rundown for anyone who's new to how this all works. I take all the films an actor or actress has been in and break them down into three categories, 'Good' 'Bad' and 'Ok.' I do not count TV appearances or Made for TV movies. Afterwards a quick analysis will show whether or not they're a good actor by the numbers. Invariably there is a 2-3 +/- point bias on a person to person basis. Also, since 'ok' movies are not bad they count towards the positive column in the overall figuring. ...and because when I saw this picture I laughed. But enough blathering. How feel you Obi Wan? Funny thing, I typed his name a half dozen times writing this, and only misspelled it on the graph. This one was extremely difficult. There were many movies that I had trouble classifying. So there is assuredly room for argument. Not as much as you'd think. Certainly not enough to swing him the other way. As for every Trainspotting, there is a Pillow Book. For the first time I wished I could include TV. Though the show I have in mind he isn't acting in. If you've never seen any of 'Long Way Round' or 'Long Way Down' I urge you to seek these out. The series follows Ewan McGregor and Charlie Boorman on motorcycles making their way across multiple countries. In Long Way Down, they go from London to New York by way of travelling through Russia into Alaska. It's fantastically amazing footage. Thanks to Tina from The Clean White Page for suggesting Ewan. I love suggestions and am only too happy to do the analyzing. Feel free to tell me below in the comments who you'd like to see covered in future editions. If you haven't already done Bobby DeNiro, the world needs to see his pie-chart. Mmmm... Ewan... Sorry -- you were saying? Nice job, lovely Ewan, and thanks for the link! The pic in the kilt is just hilarious. Thanks for including that one. 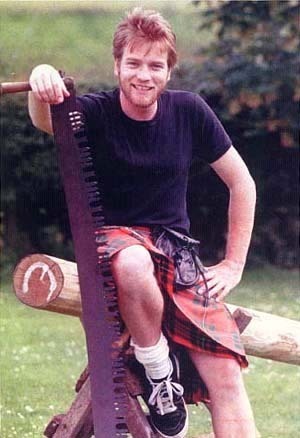 You gotta be brave to have a huge rusty saw, so close to your nether regions, while wearing a kilt. 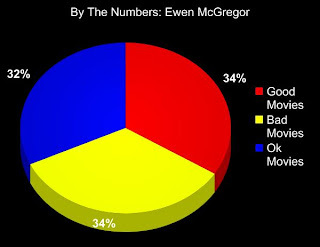 Ewan's ratio of bad to good movies would have been smaller if he didn't get on that kick of singing in movies circa 2001-2003. But he is an underrated actor and I am a fan. Ewan FWT! But that pic is hilarious and I cannot defend that.